The Rose of Mary, or rosemary is a shrub that was considered sacred to ancient Egyptians Romans and Greeks. With its deep green fragrant needles and little blue flowers, the shrub is a delight to have in a garden. It received its name from a myth where the Virgin Mary spread her blue cloak over a white-blossomed bush when she was resting and the flowers turned blue. 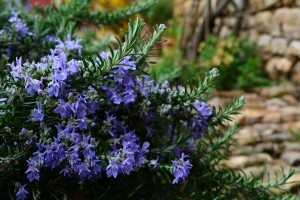 Today there are varieties of rosemary with white, intense blue, light blue, and pink flowers. Some are upright, trail low to the ground or have leaves with yellow streaks. The best and most popular variety for our region is Tuscan Blue that can grow 6 to 7 feet tall and has very aromatic, wider than normal leaves with deep blue flowers. 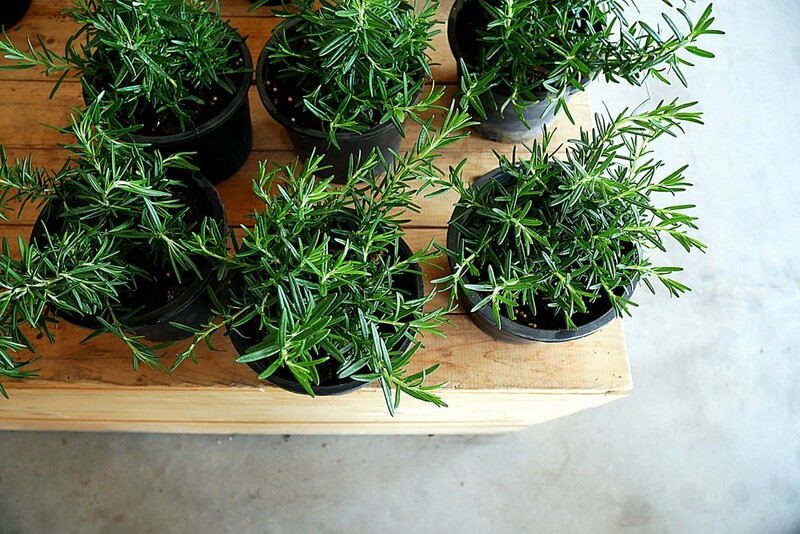 The fragrant rosemary shrub is a popular ind0or topiary during the holidays. The biblical myth that ties the rosemary to the Virgin Mary makes the plant a wonderful addition to indoor Christmas décor. Many of them are placed in pots and shaped as a Christmas tree to be trimmed with lovely decorations for the season. Or wrapped around as a wreath hung on a front door for a fragrant welcome. Come the New Year, the potted rosemary can be planted outside for a beautiful drought tolerant addition to your landscape. But the humble rosemary has many other uses as well. Rosemary leaves are used in cooking and the herb is both strong in smell and taste, making it perfect for savory dishes. Both fresh and dried leaves are used extensively in Mediterranean cuisine where the plant thrives in the warm and dry climate. During the Middle Ages, the plant was used in wedding ceremonies. A headdress made of rosemary would be worn by the bride. And the groom and wedding guest would wear a sprig of rosemary. The association with weddings has given the rosemary the reputation as a love charm. Besides improving love, it is reputed to enhance memory and also has been used as a symbol of remembrance during war commemorations and funerals in Europe. Leaves of the plants would be thrown into the graves by the mourners to keep their memories alive of those who have passed. The essential oils that reside within the leaves contains about 10-20% camphor, a phytochemical that helps repel pathogens in the body as well as harmful insects. Both flowers and leaves are used in herbal medicine to help treat a variety of ailments. Bees love the rosemary flowers and can be often seen busily buzzing around the plant gathering pollen. Rosemary honey has a strong, distinct taste and wonderful in a cup of tea or used as a glaze over meats.